Rank 890 : Attack ! I understand now, Thanks for the explanation. 10 for me! I can’t find where to enter my rating at. Help. First, you need to register as a member, then you may vote. I already am a member - but I didn’t see where to vote at? its on the bottom under record a play. I did my part… rated it a 10 (it would not accept 11). The BEST out of the box board game I have ever played! If we do that, AA50 will be object for retaliation. Remember the french guy who gave AA50 a 1 ? Give it a 6 or 7, that will do the job, and they’ll never notice. yea thats a point you got. Jeez, where do I go to find out what are truly the best board games out there? I dont need a list of what games won the best marketing campaign!!! Everything has got spin on it, is that the ticket? Yes indeed. WOTC does nothing so we must. WE are the new vanguard to support our hobby, by crook or hook. great! keep adding the 10’s keep it on top. You can only vote once? Is that right? <falling out="" of="" office="" chair=""> <uncontrollable laughter=""><attempt to="" stand="" up…="" fall="" down="" again="">“IL, IL stop <laugh>I can’t… <more laughing=”">I can’t… breath"
Well if WOTC didn’t do that all day they would have more time to update their own site and promote their games. I already got confirmation of what they have over there. Like i predicted… tattoos, green hair, weird hair cuts, weird quasi vampire attire and no work getting done. I bunch of unemployable misfits getting jobs because of who they know and absolutely no talent, no skills but employed nevertheless because they all play D$D after work. Garbage. Just garbage. I would fire everyone and hire humans next time. :lol: :lol: :lol: You tell 'em IL! I don’t know. I thought I voted earlier, but I think I might have just put it on a wish list or something. I wonder do you think BGG wants you to be registered for a while before they let you vote? Right now I can’t see any option to give it a 1-10 vote. @Sherman: What would have made the game more interesting is if they changed that rule so that you collect only half of your income, because counterattacks from somewhere else would have been a realistic possibility. Thoughts? I like this idea, new house rule to pose to the guys. Yes, I built a factory in India and Australia. The Japs went for Australia first but I was able to delay them with two of my destroyers so that Aussies could build two infantry before they could get there. 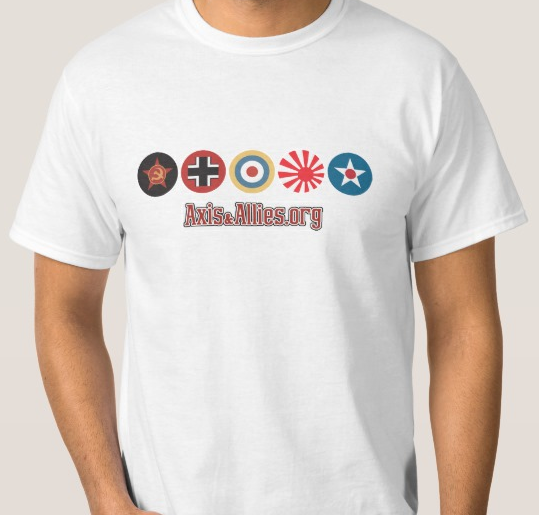 Added to the already 3 you have plus the artillery, the AA gun, and an American fighter and bomber that landed there. Since he was after the Aussies this gave time for the Indian Factory to build 3 Armor plus the 3 infantry, 1 Artillery, and AA gun that are already there. I was going to send my South African troops to help in Egypt but, by this time the Axis was already losing in North Africa and I sent them to India. I considered building a factory in Canada to avoid the German Air power when I built 1 or two ships near the UK when my fleet was in the Med. In the end I didn’t but it would have been nice to have. There should be the ability to build in all of these areas from the beginning. Looking at the '42 scenerio it looks very hard to build a factory in India without losing it right away. This has been sold. Thanks jrchase. What is the difference between AA50 and AA Revised? 3 hours for a game of Axis and Allies? lol Expect at least 4-5 hours, plus setup time. Some of the variants are only about 3 hours or less, though.